I finished up my Cashmere Gadabout last night. It's blocking and there will be photos later on this week. Once it was drying, I picked back up with my Cables and Lace Capelet, which has been languishing for weeks while Christmas knitting got finished. And I'm so glad that I did! This project has a lot of virtues. First is the yarn. I love Madeline Tosh. Sometimes, I cherish her skeins so much I become hesitant to knit with them while waiting to find the perfect pattern. But this yarn, her Super Bulky ASAP in the Weathered Frame colorway, was ordered just for this pattern and went straight onto my needles when it arrived. The second virtue of this pattern is that the yarn knits up fast and pretty in the super bulky weight. I'm not a huge fan of knitting on large needles, and the size 11s are at the outer edge of comfortable knitting for me, but still within it. And overall, they are worth dealing with because it is so stinking fun to watch this pattern take shape, so quickly. The third virtue is that it is making me feel very accomplished. 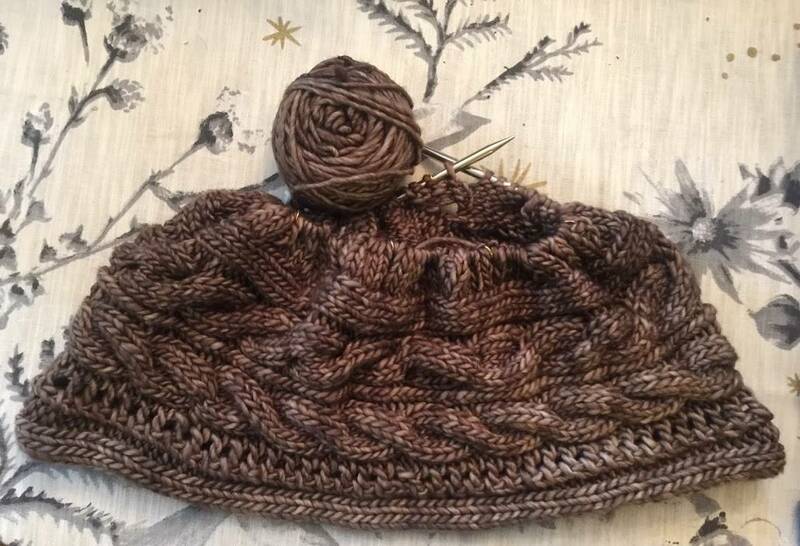 If you've looked at this pattern before you know that you knit the bottom band and then, after grafting the ends together, pick up stitches to knit the body of the capelet. I'm notorious for avoiding picking up stitches, but have been gently encouraging myself to do so over my last few projects. I'm happy I've been doing that, as last night, I picked up the 133 stitches around the edges of the band without a hitch and went onto the lace. Success! My gauge is good, even in the round. But I'm aware of pattern notes that say this project comes out too small for an adult, even though the sample project is beautiful and clearly adult sized. It's difficult to get a sense with it all bunched up on the needles, but I'll likely take it off on some waste yarn once I get a foot into the body to get a sense of whether I need to make some adjustment. Hopefully once finished, my notes on sizing will help anyone who wants to knit this down the road to get a sense of how it fits. It's such a beautiful project and this is an ideal yarn. It looks elegant and richly colored.